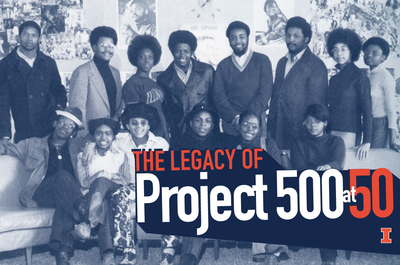 A series of events commemorating the 50th anniversary of the Project 500 initiative will take place on the University of Illinois at Urbana-Champaign campus Sept. 27-29. CHAMPAIGN, Ill. — The University of Illinois at Urbana-Champaign is welcoming back the participants in the Project 500 initiative for a weekend of commemorative events in the year of the program’s 50th anniversary. Other U. of I. supporters and community members also are welcome to take part in the events Sept. 27-29. More formally known as the Special Educational Opportunities Program, Project 500 was the first extensive effort by the U. of I. to offer equal educational opportunities for traditionally underrepresented students from Illinois. In 1967, only 372 of 30,400 students were African-American; 565 newly admitted African-American and Latino students entered the student body in 1968. Activities will kick off on Thursday, Sept. 27, with a welcome reception at Levis Faculty Center, a chance for attendees to reconnect with old friends and make new ones. On Friday, Sept. 28, attendees will gather for hors d’oeuvres at Alice Campbell Alumni Center then stroll to Krannert Center for the Performing Arts to enjoy a musical performance. After the show, they will celebrate with dessert at Alice Campbell Alumni Center. Attendees will take part in panel discussions about Project 500 on Saturday, Sept. 29, followed by a dinner at the I-Hotel and Conference Center. Project 500 participants and anyone else interested in joining the celebration may register online. Editor’s note: For additional information, contact Nathan Stephens, director, Bruce D. Nesbitt African American Cultural Center, 217-333-2092.